The beautiful, ringed planet Saturn rules the night sky this month in the Name A Star Live constellation Virgo. You can use the Moon to find this astronomical jewel, and use just about any telescope to see its rings! August also presents the best meteor shower of the year, the Perseid meteor shower. Read about this year’s Perseids in a separate blog post. You can use the Moon the evening of August 12, 2013 to find the planet Saturn. If you’re in the northern hemisphere of Earth, just face west-southwest after sunset. Venus will be the very bright object over the western horizon. The beautiful, ringed planet Saturn rules the night sky this month in the Name A Star Live constellation Virgo. You can use the Moon to find this astronomical jewel, and use just about any telescope to see its rings! The beautiful, ringed planet Saturn rules the night sky this month in the Name A Star Live constellation Virgo. You can use the Moon to find this astronomical jewel, and use just about any telescope to see its rings! But be sure to check out the elusive planet Mercury this month as June affords the best view of Mercury for 2013. On June 10 you can find the planets Mercury and Venus using the thin, crescent Moon which will appear above the western horizon that evening. All three objects will be in the Name A Star Live constellation Gemini that evening. On June 12, Mercury will appear at its highest point in the sky for 2013, although by then the Moon will not appear near Mercury. Saturn is an excellent telescopic object this summer. For those of you in the northern hemisphere of Earth (e.g., North America, Europe, Japan) Saturn will appear above your southern horizon after sunset. For those of you in the southern hemisphere (e.g., Australia, New Zealand, South America) Saturn will appear above your northern horizon after sunset. 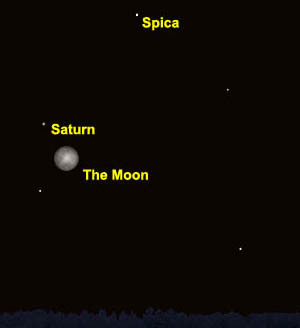 The Moon will appear near the bright star Spica and the planet Saturn the evening of June 18. 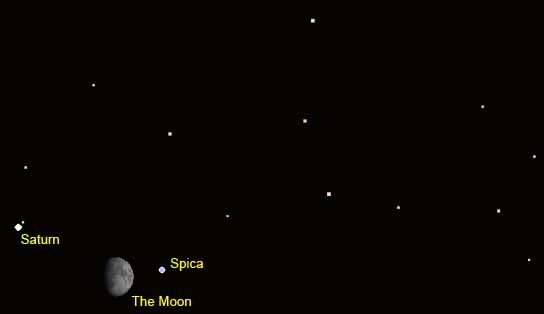 All three objects appear in the Name A Star Live constellation Spica, shown here. Stars are located within constellations, which are just areas of the night sky. Scorpius, Aries and Taurus are examples of constellations. Your Name A Star Live Star Certificate displays the name of your constellation. You can use our online World Constellation Guide to determine if you can see your constellation during the evening hours (between sunset and midnight). Of course, you’ll need a telescope to see your star. But you can see your constellation without the use of a telescope. You can also find your constellation by using our Virtual Planetarium™ astronomy software. A planisphere is another useful device. On April 25, 2013, the full Moon will be near the planet Saturn. You may also notice the bright star “Spica” in the Name A Star Live constellation Virgo. The beautiful, ringed planet Saturn shines at its brightest for 2013 this month. That’s because on April 28 the planet will reach “opposition,” meaning at sunset that evening Saturn will appear just over the eastern horizon, on the exact opposite side of the sky as the setting Sun. But you can get a good look at Saturn and its rings throughout the month, and for the next several months, through even small telescopes. Saturn will reside in the Name A Star Live constellation Libra throughout April. Saturn will be about 9 Astronomical Units (AU) from Earth in April. An AU is the average distance of the Earth from the Sun, or about 93 million miles. So in April, Saturn will be about 9 times farther away from Earth than the Earth is from the Sun. Take A Break from Your Taxes and Look at Jupiter! 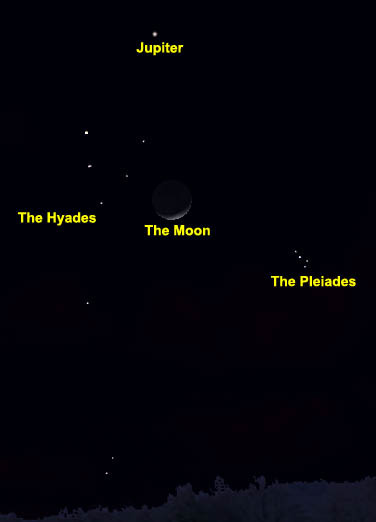 The Moon sits between the V-shaped group of stars called the “Hyades” and the beautiful group of stars called the “Pleiades” the night of April 13. The Moon also passes by our solar system’s giant planet, Jupiter, this month. Jupiter is in the Name A Star Live constellation Taurus in April. The crescent Moon will lie near Jupiter the night of April 14. So if preparing your income tax returns is driving you crazy that night, take a break, step outside and look for the crescent Moon. Jupiter will be the brightest point of light near the Moon. If you have a telescope, look at Jupiter and see if you can view its four largest moons — the “Galilean satellites.” These four moons move very quickly: They noticeably change their position over the course of just a few hours. But those of you in the northern hemisphere of Earth (e.g., North America, Europe) will likely see all four moons that night in the following order (listed from nearest Jupiter and going out): Io, Europa, Ganymede and Callisto. And consider viewing the Moon the preceding evening when it will lie between the “Hyades” and the “Pleiades” in the Name A Star Live constellation Taurus. A lunar eclipse — where the Earth’s shadow blocks sunlight from directly shining on the lunar surface — will be visible June 15 to those of you in western Australia, central Asia and Africa, and parts of Europe and South America (weather permitting). Although Earth blocks sunlight from directly shining on the Moon, some sunlight — refracted (bent) by the Earth’s atmosphere — shines around the Earth and casts an orange glow on the Moon. So the Moon does not become completely dark. The map below shows the areas of Earth where the eclipse will be visible, assuming the weather cooperates. Those of you toward the west (e.g., South America) should see the eclipse at sunset (when the Moon is rising in the east), and those of you toward the east (e.g., Australia) should see it near sunrise (when the Moon is setting in the west). Saturn dominates the night sky in May: The majestic, ringed planet Saturn appears very close to the bright, binary star named “Porrima” in the Name A Star Live constellation Virgo. If you have a chance this month, take your telescope out and look for Saturn and Porrima together: It is quite a sight to behold! Saturn and the bright, binary star Porrima appear very close to one another in Virgo this month. Jupiter appears in the predawn, eastern sky: It will be the brightest astronomical object you see toward the eastern horizon (other than the moon and the sun!). Mercury will not be visible for most of June. Moonlight ‘drowns out’ the faint light of many stars and other celestial objects, so the best time to view the stars is when the Moon is not visible. If you’re going to stargaze between sunset and midnight, then the best time to do that during the balance of June would be in the last week of the month. If you have a telescope, be sure to take a look at Saturn during the evening hours of May 22 (May 23 for those of you in Australia and other areas of the eastern hemisphere). On that evening, four of Saturn’s largest moons will appear to be lined up in a row, making for a special visual treat! Saturn and some of its largest moons. From left to right: #1 Dione, Saturn, # 2 Tethys, # 3 Rhea, and # 4 Titan. The moon below, # 5, is Iapetus, a somewhat dimmer moon of Saturn than numbers 1-4. You might want to prepare for the May 22 viewing by finding Saturn in the night sky earlier in the month: This way, you’ll know where to aim your telescope on May 22. On May 13 (May 14 for those of you in Australia, etc.) the Moon provides a ‘landmark’ (or, perhaps we should say, a ‘skymark’) that you can use to identify Saturn. 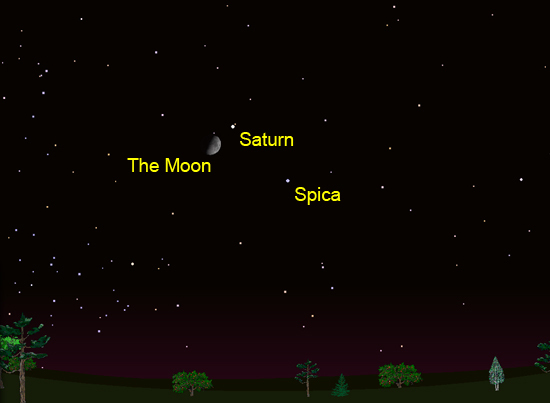 On the evening of May 13, Saturn will appear near the Moon and the bright star Spica. For those of you in Australia and other parts of the southern hemisphere, see the image below. Saturn, with its wonderful rings, is indeed an impressive sight through any telescope. Be sure to take a look at this planetary jewel while the viewing is still good! Saturn dominates the night sky in May: See the discussion above for information on how to find it. Venus, Mars, Jupiter and Mercury are all ‘morning stars’ this month, barely visible over the eastern horizon at sunrise. Those of you in the southern US and the southern hemisphere will probably get a better view of these four planets this month than those of you in more northern latitudes. Look for Jupiter and Mars together, low in the eastern sky on May 1 (May 2 for those of you in Australia and the eastern hemisphere). On May 11 (May 12 for those of you in Australia and the eastern hemisphere), look for the bright planet Venus and Jupiter to appear close to one another: The elusive planet Mercury will be near Venus and Jupiter that morning as well. Halley's Comet left a lot of dust particles in its wake: Every year, Earth flies through those dust particles, which burn up in our atmosphere as "shooting stars." The “Eta Aquarid” meteor shower peaks the evening of May 6 (May 7 for those of you in Australia and other parts of the eastern hemisphere). Although this is not one of the largest meteor showers of the year, it has the advantage of occurring when moonlight won’t interfere (moonlight ‘washes out’ a lot of dim shooting stars). Depending on where you live in the world and how far away you are from city lights, you may see as many as 70 shooting stars (metors) per hour that evening. No telescope or binoculars are needed! Just lay down on a blanket or reclining chair, look up and enjoy! Moonlight ‘drowns out’ the faint light of many stars and other celestial objects, so the best time to view the stars is when the Moon is not visible. If you’re going to stargaze between sunset and midnight, then the best time to do that this month is during the first five or six days, and during the last week of May. A trio of bright planets will gather together in the Name A Star Live constellation “Virgo” in early August, putting on quite a show for stargazers around the world! To enjoy this heavenly treat, go outside about 45 minutes after sunset each night during the first week of August and face west. (See diagram below.) The red planet Mars, the beautiful ringed planet Saturn, and the hot and cloudy planet Venus will fly in a triangular formation that will change from night-to-night. Moreover, if you have a good, clear view of the western horizon you might also see the elusive planet Mercury. 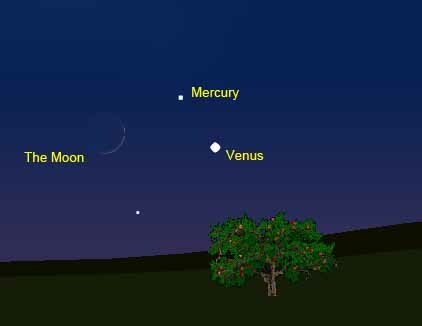 If trees, buildings, hills or other structures are in your way, try to observe Mercury from an elevated location, like a hilltop or an upper-level office in a skyscraper or other building. Back to the planetary triangle: On August 1, Mars and Saturn will be quite close to one another, while Venus will stand aloofly apart. But over the course of the next week, Venus will lose its shyness and gradually move closer and closer to Mars and Saturn. By August 8, the three planets will form a compact triangle. But don’t let appearances fool you! While these three planets may appear to be close to one another, in reality they are quite far apart: On August 8, Saturn will be about 951 million miles (1.5 trillion kilometers) from Earth; Mars will be about 190 million miles (305 million km) from Earth; and Venus will be a paltry 72 million miles (115 million km) from Earth. To put all that in perspective … If you could drive your car to nearby Venus at the leisurely rate of 55 miles per hour (about 89 km/hour), it would take you 149 years to get there! Author nameastarlivePosted on July 29, 2010 Categories GeneralTags bright planets, compact triangle, planet mercury, ringed planet saturn, western horizonLeave a comment on A Triangle of Planets! Want to see where your star is in the night sky? 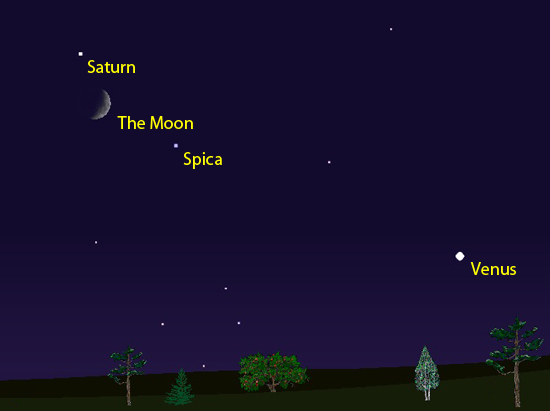 Several planets are visible with the naked eye in May, including Venus, Mars, Saturn and Jupiter. Venus is the bright object you’ll notice in the western sky around sunset this month: It will set in the west a couple of hours after sunset. It is in the constellation Cancer now. Mars is in the constellation is in Leo this month: If you live in the northern hemisphere of Earth, Mars will appear toward the west-southwest after sunset. If you live in the southern hemisphere, Mars will appear toward the north-northwest at sunset. The ringed planet Saturn will be to the east of Mars — in the constellation Virgo. If you live in the northern hemisphere of Earth, look for Saturn toward the southwest after sunset. If you live in the southern hemisphere, look for Saturn toward the northwest after sunset. Like all the other planets, Saturn gradually moves west across the night sky. In fact, Saturn will be visible through most of each night in June. If you’re an early bird, then you might see the mighty planet Jupiter as it rises above the eastern horizon before sunrise this month. Next to Jupiter is the planet Uranus, but you’ll need a telescope to see it. You can use our new, online World Constellation Guide to determine if you can see your constellation during the evening hours (between sunset and midnight). Of course, you’ll need a telescope to see your star. (That’s why we include the SLOOH online telescope experience in our Deluxe, Framed and Ultimate Gift Sets!) But you can see your constellation without the use of a telescope. Galaxy Cluster MACS J025.4-1222. Click image above to view video. Venus is the bright object you’ll notice in the western sky around sunset this month: It will set in the west a couple of hours after sunset. Mars is in the constellation Cancer this month: If you live in the northern hemisphere of Earth, Mars will appear toward the south after sunset. If you live in the southern hemisphere, Mars will appear toward the north at sunset. The ringed planet Saturn will be to the east of Mars — in the constellation Virgo. If you live in the northern hemisphere of Earth, look for Saturn toward the southeast after sunset. If you live in the southern hemisphere, look for Saturn toward the northeast after sunset. Like all the other planets, Saturn gradually moves west across the night sky. In fact, Saturn will be visible through most of each night in May. If you’re an early bird, then you might see the mighty planet Jupiter as it rises above the eastern horizon shortly before sunrise this month.